My research centres around the training and use of dogs to detect odours of human diseases including cancer. I suggest that this work illustrates a unique mode of incorporating animals into medical research that is distinct from the traditional “lab animal” scenario. Therefore, it raises interesting questions about human-animal relationships and the pursuit of scientific knowledge. This means of using animals in scientific research builds on numerous anecdotal stories of dogs alerting their owners to their cancer prior to their clinical diagnosis. In these stories, the dogs have been said to persistently sniff at specific areas of their owner’s body. One likely explanation for this is that cancer causes changes at a cellular level and these changes are reflected in the volatile organic compounds excreted in biological substances such as urine, sweat and breath. Human noses are incapable of smelling the complex pattern of chemicals that indicate human disease, but with around 300 million olfactory receptors (humans have just 5 million) dogs are excellent candidates for this work. During training over several months, dogs are taught to identify the odour of cancerous urine samples. They learn to sit when they find a sample containing cancerous odour and to ignore control samples. One of the goals of those involved in this research is to identify biomarkers of disease that will assist in the development of “electronic nose” sensors. Thus, this area of research presents a significant opportunity for dogs to help us understand more about cancer and other diseases, in addition to building knowledge about dogs’ olfactory capabilities. The focus of my research lies in asking questions about the novelty of using dogs in this way in scientific research. Some of the most obvious differences about the animals in this context, compared to animals used as models in experimental research, are illustrated in the husbandry practices. 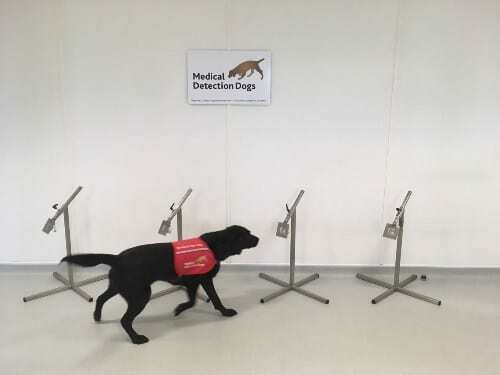 Unlike experimental research that often employs animals as models for studying disease, the dogs enrolled in training and research studies in the detection of cancer are not constrained under the same conditions of captivity. 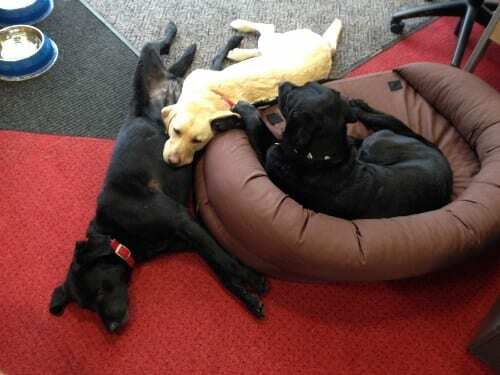 Whilst “at work”, they are not kennelled but instead free to roam the office, curling up for naps under the desks of their human co-workers. In the evenings and weekends the dogs live akin to pets in the homes of foster families. I hope to unpack what this novel case of animals in science reveals about shifting attitudes and responsibilities towards animals in science, as well as the place of dogs in Western society more broadly. Furthermore, I hope to bring to light the challenges and possibilities that emerge when researchers work with animals as active participants in the process, as my case study exemplifies, rather than merely on them as passive research tools. Dogs like Kiwi are considered “working animals”, assisting humans in research surrounding cancer and other human diseases. The dogs follow a work schedule comparable to their human co-workers: they come in to work 9-4 several days per week and spend evenings and weekends in the homes of their foster families. Sometimes they even get to join their foster families on holidays. Thus, their subjectivity is multiple as they are simultaneously both “worker” and “pet”. Katrina Holland is a final year PhD student in Anthropology at University College London, funded by the Economic and Social Research Council. With acknowledgment and thanks to the humans and dogs at Medical Detection Dogs who welcomed me into their worlds. Medical Detection Dogs receives no government funding for the work the charity does and relies entirely on the generosity of donations from trusts and the public.